my friend from Kansas sent me a home video sharing her space and landscape of US heartland. it came in a mini DV (smaller tape) format. i don't have a video camera but thought i could find someone who has. unfortunately i couldn't find one or a way to convert it to vcd / to computer. so i couldn't watch the content of the tape for months. to find a professional photo / video studio who might convert such tapes to vcd, i called few places but with no luck. on a sunday morning, about two weeks back (april 6), decided to go out to visit Self Realization Fellowship (SRF) temple at hollywood. the tape was in my bag and just the night before i was thinking i must find a place to convert this tape real soon so that i can send the original back. my friend was becoming impatient that i couldn't manage to watch it after such a long time. i felt bad too. i found out the address of SRF temple and got the bus direction. taking the bus got down to a junction thinking this is the right cross road. walking a further down hoping to find the temple, i soon realized i made a mistake (instead of Sunset Blvd, i got down at Santa Monica Blvd). to be sure i walked further down on the wrong street, seeing a big church from distance. walking towards it noticed that it was a beautiful armenian church. as i started to walk back again, just around the corner saw an ethnic armenian video store and felt like walking in to ask about the tape. to my surprise they said they can convert the tape for me and you can imagine how delighted i was to find it in such accidental fashion. after searching so many places i ended up finding the solution where i least expected. often by such unconscious mistakes we are guided to places where we need to be. like Buddha said, "When you realize how perfect everything is you will tilt your head back and laugh at the sky". but more surprise for the day was yet to come. submitting the tape for conversion, i walked back to the original cross road to catch bus and this time got down at the right cross street address (vermont, sunset) from where SRF temple is just 5 minutes walk. as i was approaching the temple gate, two bus just arrived with loads of visitors. walking inside the gate i found monks and temple people waiting to receive the visitors who just arrived. 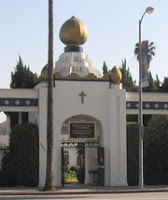 i was told that the visitors were scheduled for a tour in the temple and they are senior devotees of Paramahansa Yogananda from Escondido and Encinitas of Southern California, major sites where Paramahansa Yogananda chose to build temple and spiritual community. people from the temple were all busy receiving the honored guests and as i wasn't from the same group, i had to ask permission to sit in the temple while the guest were there. generously i was given permission. since most of the people in the group are life long devotees of Sri Paramahansa, there were talks, nice tour arranged to the whole temple ground and also screening of a rare movie of Paramahansa during the time when he first opened the temple. it was a great blessing that i got permission to watch the rare movie with the circle of devotees and had a beautiful tour on the same sacred ground upon which Paramahansa once walked. what made me really surprised later was the timing, because if i didn't make the mistake of landing on wrong cross street, i wouldn't find the armenian video shop. and as the landing on the wrong place, wandering - took time, by the time i reached the temple it was in sync with the arrival of the devotees, which just in time enabled me to be part of the tour. all so perfectly arranged. while going to the temple i was telling in my mind, "Guruji i am coming to see you". (Guruji meaning the master), and there it was! in first visit to the temple there were unexpected arrangements to not only get a tour with so many devotees but also blessed opportunity really to watch Guruji's rare and exclusive video of opening ceremony of the temple. the darshan was granted. darshan, (litereally means seeing) is a sanskrit term which is reserved for a seeing or being in the presence of a saint, or a sacred place. i know if Guruji were here, he would say smilingly, "This is how Divine Mother works!" indeed this is how everything is done, even with apparent mistakes and through detours. 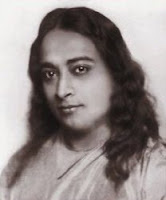 let me mention here a little about my connection with Paramahansa Yogananda. not just because this famous spiritual master was from Bengal (same land from where i come from), not just because we have the same mother tongue, but for some totally other, unknown reason i always felt great attraction and inspiration to and from this master. even before i came to California, US (where he spent major part of his life), i felt attraction to him, his personality and teachings. once coming to US again and again i stumbled upon SRF devotees and people who have SRF connection. 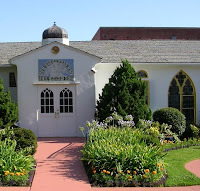 the very sufi group, shadhiliyya sufi order where i took hand also has many life long devotees of Sri Paramahansa Yogananda and former SRF members. that day was another glimpse of recurring connection with this great saint. to me Paramahansa is, what sufis call an insan e kamil, a realized human being or universal man, who not only embodied highest devotion to the Divine internally and privately, but also exemplified with work on the outer plane. he whole heartedly embraced and worked both in invisible and visible planes in terms of teaching, sacred work and building spiritual community. his state of spiritual realization surely is a gift to humanity open to all to receive. Sri Yogananada was one of those blessed beings who dared to be gone to find himself and came back from realization to help others to walk the path of seeking too, a hallmark of insal e kamil. may God sanctify Sri Paramahansa Yogananda's spiritual station and bless us with his realization.